While this does have a lot of ingredients, don’t let that scare you. It is delicious and worth the time. Each of the parts below (the beans, the sweet potatoes and the mushrooms) will work alone as their own side dish. And, when you combine them all together, you’ll get your daily dose of veggies all in one meal! Make beans: In a small saucepan on medium heat, combine black beans, ground cumin, and salt and cook until warm. Add chopped cilantro and fresh lime juice. Make potatoes: Whisk together olive oil, maple syrup, chili powder, cayenne, and salt. Toss with sweet potatoes. Roast on rimmed baking sheet at 425°F until golden brown and tender, stirring halfway through, 35 to 40 minutes. Make mushrooms: Whisk together balsamic vinegar, olive oil, Dijon mustard, salt, and pepper. Toss with mushrooms. Roast on a rimmed baking sheet at 425°F until liquid has evaporated, 20 minutes. Make sauce: In a food processor, pulse roasted red peppers, parsley, roasted salted almonds, and pinch salt until almost smooth. Make crumbs: Heat olive oil in a small skillet on medium-low. Add breadcrumbs and toast, stirring until golden brown, about 3 minutes. Transfer to a small bowl and add finely chopped parsley and grated Parmesan. 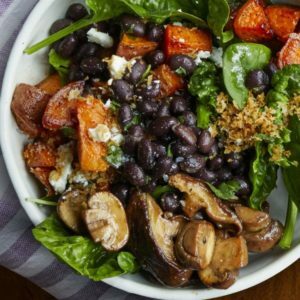 Assemble all ingredients, dividing into 4 bowls: Combine spinach, black beans, potatoes, mushrooms, sauce, crumbs, and crumbled feta in bowl.